Create this beauty with Cat Nix using a rainbow color palette to make this mesmerizing quilt. Intermediate level. Baubles n Beads is comprised of 31 fabrics. The combinations of color and textures have been carefully selected and arranged to create this colorful and festive wallhanging, perfect for every occasion. 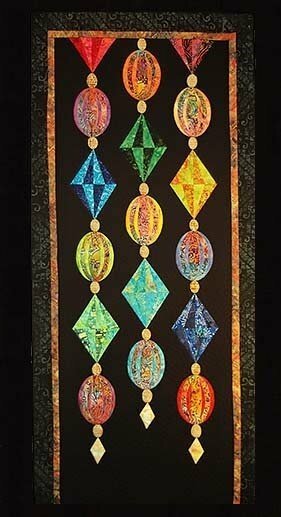 The Baubles n Beads class includes detailed steps specific to constructing the Baubles n Beads foundation pieced and applique blocks as well as instructions for attaching lapped borders and binding. Requirements: Baubles n Beads pattern by Cat Nix required for class.